Compulsive sexual behavior (CSB) is overrepresented among adults with substance use disorders (SUD), yet there is no empirically supported CSB treatment for this population. Cross-sectional and single case designs supported dispositional mindfulness as a potential CSB intervention target. However, the relations between CSB and each of the five dispositional mindfulness facets remain unknown. Extending prior research to inform intervention efforts, we reviewed medical records for 1993 adults (77.6% male) in residential treatment for SUD to examine gender differences in the relations between dispositional mindfulness facets (acting with awareness, observation of experience, describing with words, nonjudging of inner experience, and nonreactivity to inner experience) and five CSB indicators (loss of control, relationship disturbance, preoccupation, affect disturbance, and internet problems). For men, path analyses revealed that acting with awareness, nonjudging of inner experience, describing with words, nonreactivity to inner experience, alcohol/drug use and problems, and depression and anxiety symptoms related to CSB (p range .00–.04). For women, acting with awareness, nonjudging of inner experience, alcohol/drug use and problems, and depression symptoms related to several CSB indicators (p range .00–.04). 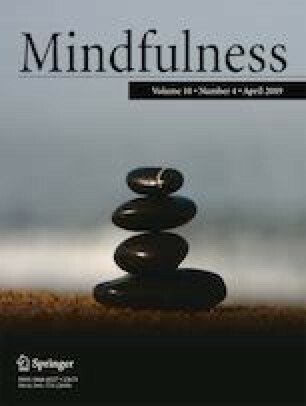 Mindfulness-based CSB interventions should evaluate the benefit of increasing intentional responses towards present-moment experiences among adults with SUD. Targeting alcohol/drug misuse, negative affect, and judgment towards thoughts and emotions may be beneficial. MJB: conceptualized the research questions, collected, cleaned, and analyzed data, and wrote the paper. RCS: aided in data analysis and collaborated in the writing and editing of the final manuscript. SA: collaborated in the writing and editing of the final manuscript. GLS: collaborated in the writing and editing of the final manuscript. Gregory Stuart conducts psychoeducational treatment groups for patients at Cornerstone of Recovery for a maximum of 4 h per week. None of this research project pertains to any of the psychoeducational groups. Dr. Stuart does not ever do any study recruitment, is not informed which patients do or do not participate in research, and does not mention anything about research to the patients attending groups. Ryan Shorey works as a research consultant at Cornerstone. There is no restriction on what Ryan can publish and his research consultation does not influence the study results in any way. Ryan does not interact with Cornerstone patients. Ryan has reported all his consultation activities to the University of Wisconsin, Milwaukee, and no concern about financial conflict of interest has been raised. All procedures performed in studies involving human participants were in accordance with the ethical standards of the institutional and/or national research committee and with the 1964 Helsinki Declaration and its later amendments or comparable ethical standards. The University of Tennessee’s Institutional Review Board approved the procedures used in the present study. Informed consent to have their de-identified medical records used for research purposes was obtained from all individual participants included in the study. Brem, M. J., Shorey, R. C., Anderson, S., & Stuart, G. L. (2018). Does experiential avoidance explain the relationships between shame, PTSD symptoms, and compulsive sexual behavior among women in substance use treatment? Clinical Psychology and Psychotherapy, 25(5), 692–700. https://doi.org/10.1007/s12671-017-0748-4. Grossman, P., & Van Dam, N. T. (2011). Mindfulness, by any other name…: trials and tribulations of sati in western psychology and science. Contemporary Buddhism, 12(1), 219–239. https://doi.org/10.1080/14639947.2011.564841.